If you have been following our blog or have been in the trading and investing game for a while, you know that portfolio diversification is essential. To quickly sum it up, diversification essentially means spreading assets your assets among a variety of investments. Doing this helps to mitigate risk and provides the potential to improve returns. To build a well-diversified portfolio, invested capital should be spread in various assets or asset classes so that if one of the assets does not do well, your capital will be safe in other assets. 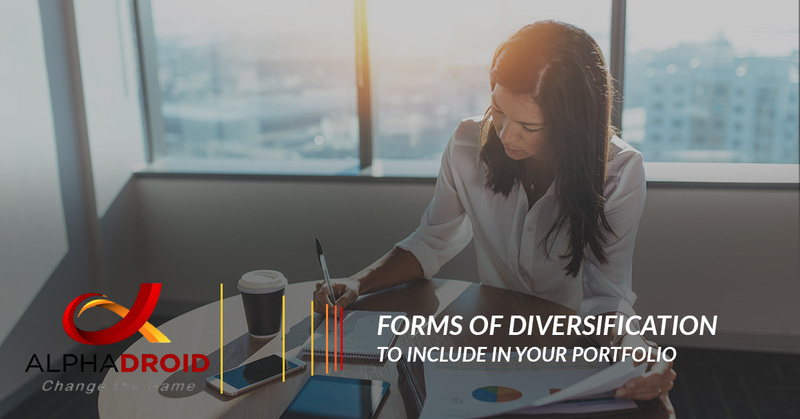 Choosing which forms of diversification to add to your investment portfolio is not as easy as it may seem, and to help, we are going to review some of the most important ones to include in your portfolio. Having a balance across the multiple industries in the economy is essential. However, it is just as important to remember to diversify away from the industries that you are most familiar with. For instance, similar to the home-country bias, people tend to overweigh the industries that they are most familiar with. According to a study done by JP Morgan those that reside in the West often overweight technology as they are more familiar with the tech giants that are based out there or they work directly within the industry. Additionally, the research revealed that the south favors energy, the Northeast, financials, and in the Midwest, industrials. With all that said, the objective is, just like with company stocks, it is not healthy to overwrite an industry that you rely on for paychecks or regional economic health. Just like getting a mix of industries is essential to a well-diversified portfolio, having balance across different individual companies is equally as important. Today, its easier than ever before to get a diversified allocation of stocks through a cluster of varying index funds. However, this was not always the case. In the 1950s, Dr. Harry Markowitz demonstrated how a portfolio’s risk would drop considerably as additional stocks were added to the portfolio—even if the individual stocks were all of equal risk. This was a part of the mathematical framework that formed Modern Portfolio Theory (MPT). However, recent research has revealed that from 1983 to 2006 nearly 40 percent of stocks lost money, 20 percent of stocks lost at least 75 percent of their value, and about seven percent of stocks underperformed the Russell 3000 index. Additionally, the best 25 percent of all stocks during the research period accounted for nearly all profit gains. Different assets, such as stocks, bonds, real estate, cash, or commodities, are more than likely going to perform differently in varying economic environments. For instance, while in an economic recovery, stocks are likely to perform well, while bonds provide protection during a recession. Commodities, cash, and other assets can protect against the conditions of market inflation, while during a deflationary environment, long-term bonds are generally the best investment. Within each asset class, there are varying strategies to get the desired exposure. Many of these differing strategies — often referred to as factors, risk factors, smart beta, etc. — have been proven to produce profitable returns over time compared to a market-cap weighted index. But, it is important to understand that this outperformance doesn’t happen consistently each year. In fact, there can be long periods of time where strategies underperform. For many investors, the best method is to mix strategies with the expectations that they won’t have all of their assets allocated to one trending strategy, but that they also won’t be fully committed to a strategy that is not performing well. Again, many investors are biased towards companies that are based in their home country. However, studies have shown that diversifying with international companies can also be beneficial. Similar to diversification by asset classes or strategies, there will not be one economic region that will consistently outperform compared to others — in fact, many economic regions will underperform for long periods of time. Also referred to as dollar-cost averaging, investors that are still contributing to their investment accounts can significantly reduce the impact associated with poor investment behavior or unfortunate timing. While studies show that around 70 percent of the time investing a lump sum is better than investing it over time, adding time diversification or any rules-based, disciplined approach can lead to better investor behavior and therefore better investment results. Including these forms of diversification in your investment portfolio can certainly help investors and advisors reap the benefits and be more likely to attain profitable returns and avoid risks. However, diversification does not entirely protect portfolios from risk. Due to the various sources of risk to face related to companies, markets, funds, strategies, and other events and matters, a single act of diversification will not eliminate all factors of risk. 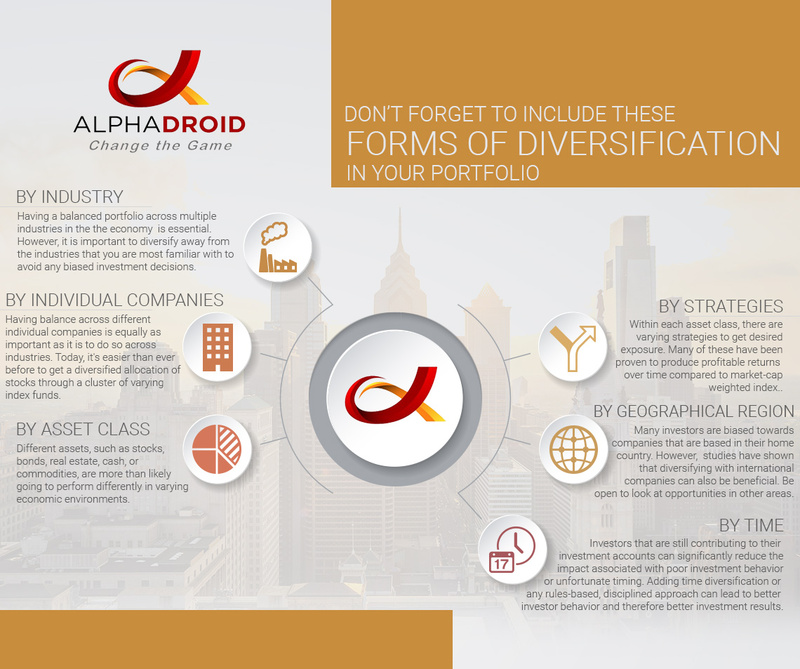 However, there is a way to reduce portfolio risk even more than diversification can, and that way is AlphaDroid. AlphaDroid is an elite investment portfolio management software that allows investors to analyze, construct, and compare various investment portfolios. The AlphaDroid portfolio management software was designed to reduce risk on a variety of levels. Want to experience the power of AlphaDroid first-hand? Try a free trial of our elite investment portfolio software investment portfolio software today!